Whether it's high RPM, high power density, or for some, high failure rate, the word “high” is regularly used to describe various attributes of the rotary engine. Today we are fighting against the rotary engine's high inclination for dangerous oil temperatures and ignition break-up. This requires significant upgrades to both the oil cooling system and the ignition system…and by upgrades, we of course mean complete redesign. For those who are familiar with FD RX-7's and the very few factory options/trim models available already know one of the primary reasons why the R1 model is more desirable than the Base model. For those who don't already know, no it isn't the factory front lip, rear spoiler, or suede seats, it's the fact that they came equipped with dual oil coolers. All RX-7's had an external oil cooler behind the driver's side duct in the front bumper, but only the R1 model had a cooler behind the ducts on both sides of the car. This may not seem like a big deal to some people because most piston engine cars don't have to take oil cooling quite as seriously, especially for street cars. Many performance oriented cars (Nissan 350Z, Subaru WRX STi, Honda S2000, Acura NSX, etc) have a water cooled oil cooler that is sandwiched between the oil filter and the block. This uses hot engine coolant to cool the oil and while it does work because water temperatures are usually cooler than oil temperatures, it is not as effective as an external air-to-oil heat exchanger. One common and inexpensive modification for base model RX-7's like this is to simply add a second oil cooler from an R1 model and call it a day. That, however, isn't going to cut it for a 400+ wheel horsepower RX-7 that will see heavy track use and time attack sessions. In this car we need dual aftermarket oil coolers designed with racing in mind. Enter the Earl's 19-row oil cooler. This is one of two coolers that we are installing on Project RX-7 and it should greatly increase the cooling capacity and efficiency over the OEM system. The Earl's coolers not only have eight more cooling passages (rows) than the OEM coolers, but they also have a higher fin-density between each row. 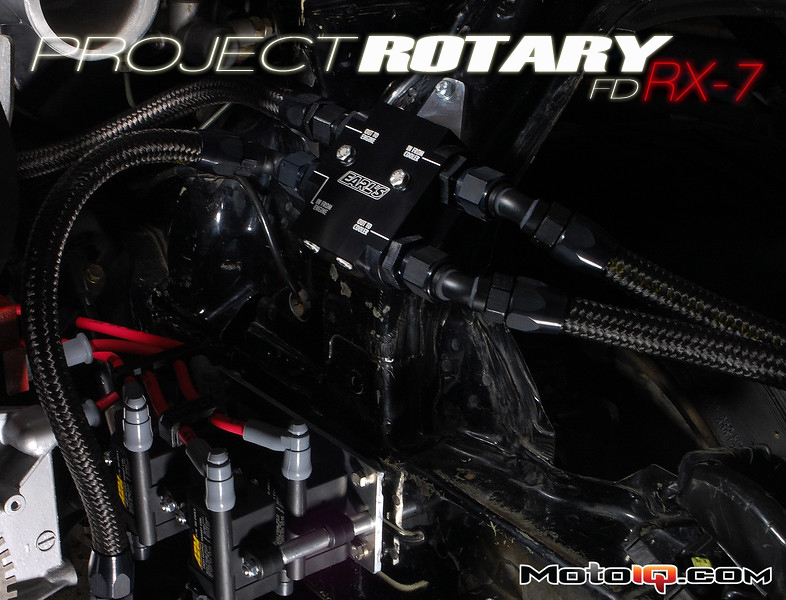 The cooler also features -10AN inlets and outlets that won't restrict the oil flow required by the 13B-REW rotary engine and will accomodate the use of high-quality braided hose and aluminum hose ends. 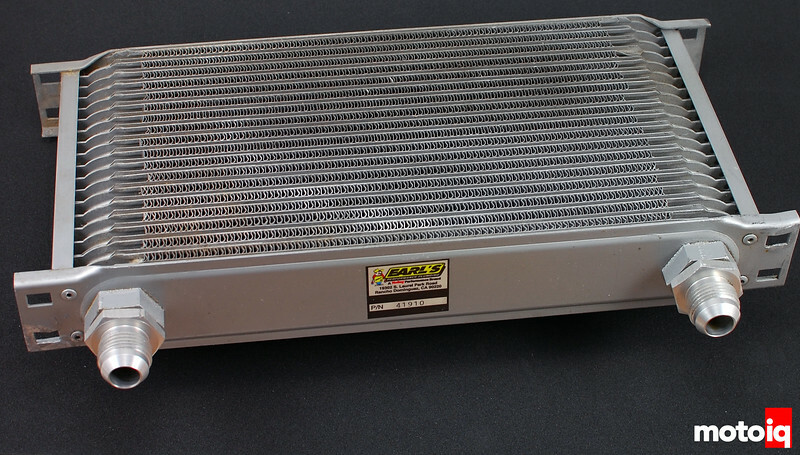 The dual 19-row aluminum oil coolers from Earl's Performance Plumbing that we are utilizing to cool the oil in Project RX-7 are a substantial upgrade over the factory system. The combination of extra cooling passages and a higher fin density increases heat exchanger efficiency by increasing the total amount of heat transfer surface area. Surface area is very important because it is one of the three primary variables used to quantify heat rejection. The only real downside to increasing surface area through increasing fin density is that you also increase the static pressure required for airflow to pass through the core. This is generally only a problem at low speeds and can be remedied with proper (sealed) ducting. One common misconception in oil cooling is that you want the oil to be as cool as possible. This is simply not the case. Engines are designed for a certain temperature range of hot oil for proper lubrication, flow, and oil life. In order to make sure we get up to this temperature in a timely manner it is important to install a thermostat that keeps oil from being cooled by the oil coolers until up to operating temperature. For this we again turned to Earl's Performance Plumbing. 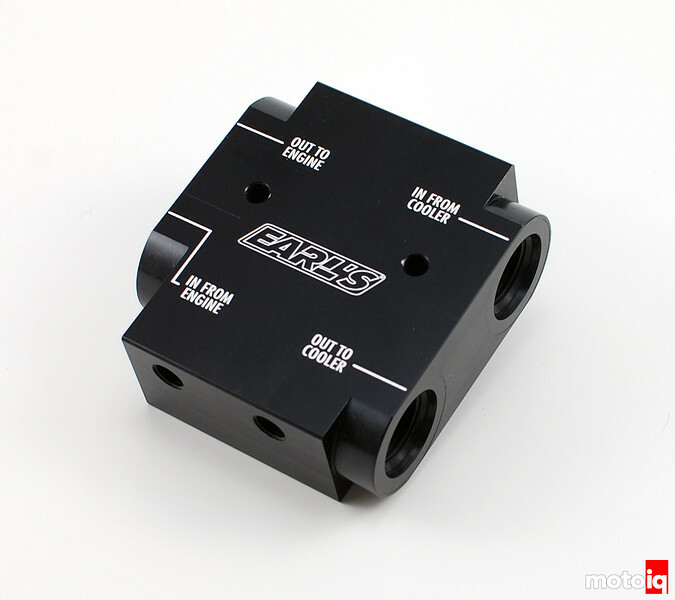 The Earl's oil thermostat is replacing the old aftermarket thermostat that was previously installed on the RX-7. Like the old thermostat, the Earl's thermostat begins to open at 160-degrees Fahrenheit and is fully open by 180-degrees. The difference is that the Earl's thermostat uses -10AN fittings via -10AN ORB inlet/outlet ports rather than smaller 1/2″ NPT ports. The Earl's thermostat also has three 1/8″ NPT ports for pressure transducers or temperature sensors and two thru-holes for mounting; both of which were missing from the old thermostat. Because we love making random technical drawings in MS Paint so much, here is a basic diagram showing how the Earl's oil thermostat works. The upper image shows the thermostat in the closed state when the oil termperature is below 160F. 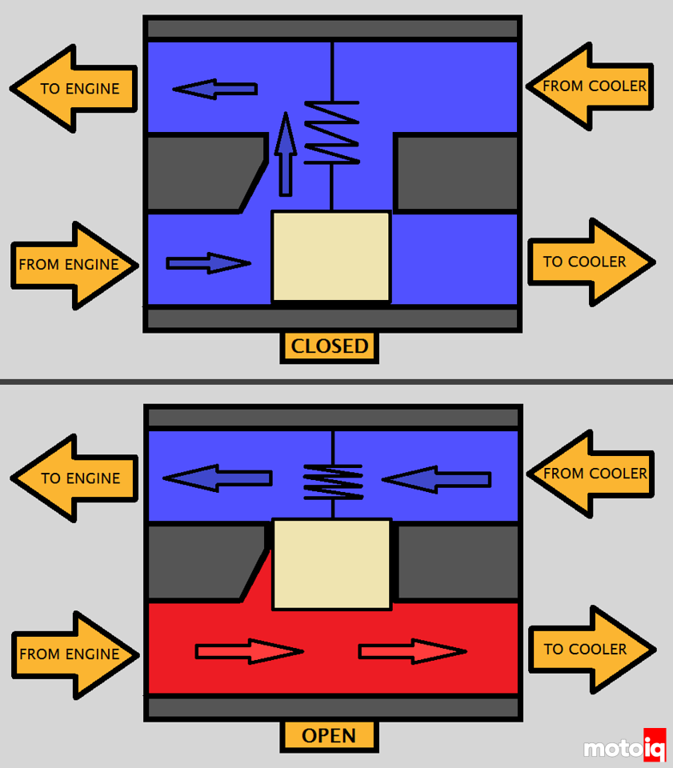 In this state, the oil completely bypasses the coolers and is returned to the engine. Once the oil reaches 160F, the thermostat will begin to open and some percentage of oil will go through the coolers while the rest is bypassed. The lower image shows the thermostat after the oil reaches a 180F where it is completely open. At this point all oil flow will pass through the coolers for maximum cooling. Project Isuzu VehiCross Part 1: What Are We Getting Ourselves Into? Sneak Peak-Tanner Foust’s 2015 VW Passat Formula Drift Machine!